The U.S. Army had a power problem, and the consequence was no small matter: Troops were left more vulnerable to sniper attacks. But now, the Army says, the use of solar and wind systems is keeping the power flowing and, as a result, helping reduce casualties. The Reusing Existing Natural Energy, Wind & Solar system, or RENEWS, enables the harvesting and utilization of wind and/or solar power and is intended to produce up to 300 watts of energy field usage in silent, remote operations where the supply of power and fuel resupply is difficult or risky, noted Daniel Berka, an electronics technician in CERDEC’s Command, Power & Integration directorate, or CERDEC CP&I. 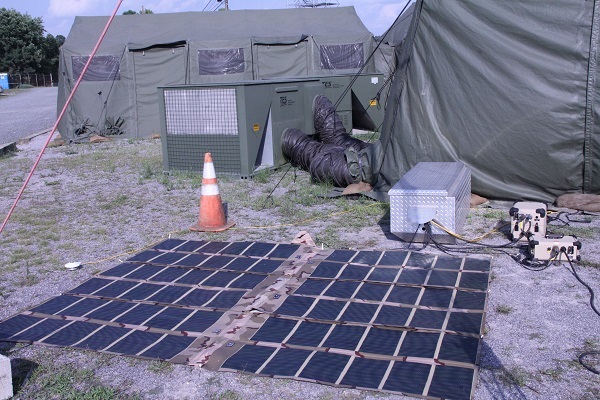 We first wrote about RENEWS when it was in development last year, as the military worked to find a microgrid solution that took advantage of renewable energy (and thus become less reliant on shipped in fuels). The system can come with a wind turbine, three 124-watt flexible solar panels, a power conditioner, an AC inverter, and a battery storage/charging unit that contains six BB-2590 rechargeable batteries — but it’s flexible.